..the beautiful pink lakes of Las Coloradas. A lot of people who visited Mexico already, told me about their favourite towns, beaches, or Mayan ruins I should definitely visit. One friend even sent me a map of 100 taquerias he made in Mexico City. I’ll see how far I come with those. 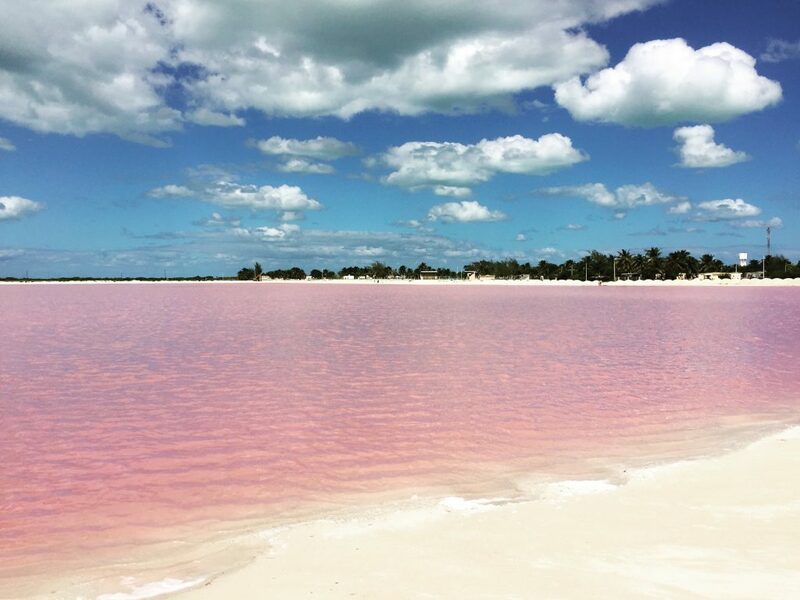 But none of them mentioned the salt lakes on the northern tip of Yucatan, known for their pink colour therefore called the pink lakes of Las Coloradas. I found out about it randomly on a blog, did some more research and realised it was a bit off the beaten track. This confirmed when out of several tens of travellers I met, almost nobody had heard about the pink lakes before. 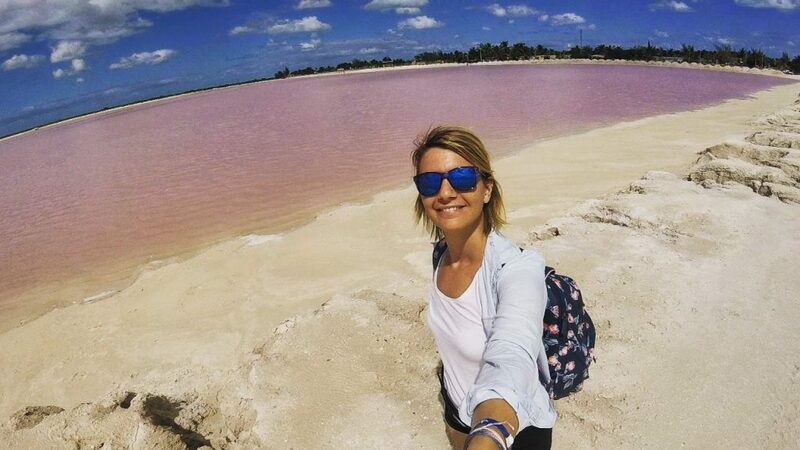 Only two French sisters in my hostel in Tulum had Las Coloradas on their “to go” list so the pink lakes of Las Coloradas ended up on mine too. Red-coloured algae, plankton and shrimp colour the water pink. Of course there is a reason not many people know about it: it’s freaking complicated to get there. But since I had set my mind to it in Europe already, dropping the lakes off my list wasn’t an option. I asked about the ways to get to Las Coloradas in my hostel in Valladolid, and in a tourist office there too. The hostel receptionist told me he doesn’t know the exact schedule, but there are two or three buses a day going there and the last one coming back from the lakes at 3.15pm. Everyone else told me to go to Rio Lagartos, a town of about half an hour from the lakes and take a guided tour from there. Now, I really didn’t want to do that and overpay, so I decided to just hop on the bus and go directly to the lakes. At that point I didn’t yet know that I would end up overpaying anyway. The pink lakes of Las Coloradas – So pink! I took an early morning bus from Valladolid to a place called Tizimin for 27 pesos (a bit more than a euro) and this is also how much another bus from Tizimin to the lakes was supposed to cost. The main problem of the first bus (and consequently my big problem) was that is was almost half an hour late, which made me miss my connection. As I would’ve had to wait for another two hours, I decided to just take a taxi (yes, I know. ..). A bit of price bargaining in espanish (I’m getting better at it!) and Ivan was taking me towards Las Coloradas for 300 pesos, which is about 13 euros and a half. Up until that point, it was the most expensive thing I paid for in Mexico. Somewhere half way into our ride Ivan asked me if I want him to wait for me at the lakes and then take me back. After I declined (“No gracias, voy en autobús a las tres y cuarto”), he casually dropped the bomb: there was no bus from Las Coloradas to Tizimin that day anymore. I liked Ivan but I didn’t buy his taxi talk for a second. I asked every living soul I saw in that tiny fishing village (which added up to only five people actually), but it was like a taxi conspiracy: either they didn’t know or they said the last bus just left some minutes ago. Because I had plans to travel on to another city that evening, the adventurer in me eventually gave in and bargained for a 200 pesos (it still hurts!) ride back to Tizimin. 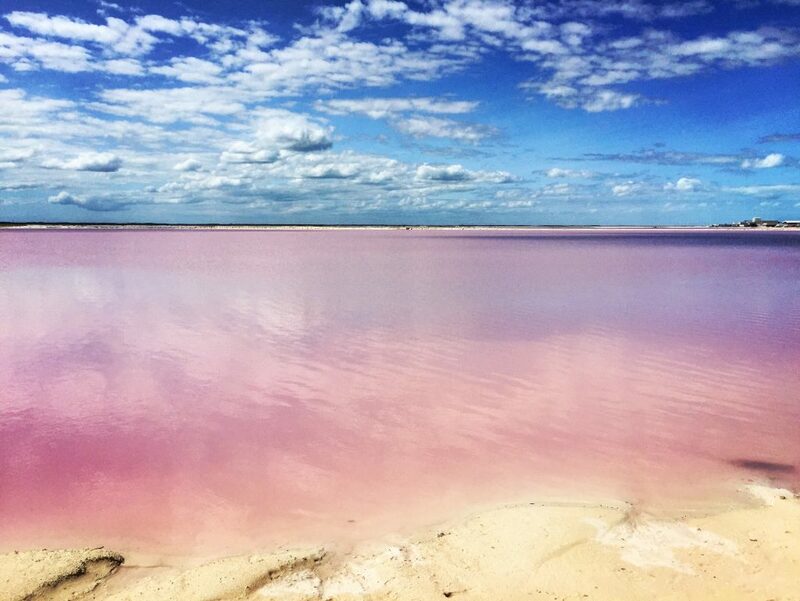 The pink lakes of Las Coloradas – In Las Coloradas they have the second largest salt factory in Mexico.